YES YOU CAN GROW YOUR HAIR LONGER AND STRONGER! Scalp brushing gives you deep follicle stimulation. Using a small medium bristle brush over your scalp will exfoliate your scalp and provide deep root stimulation to your hair follicles. This can be done 3 times a week. Works best as a pre poo treatment before your shampoo. Better stimulation than scalp massages. Create a serum of fresh aloe vera gel. Straight from the plant is the best option for this technique. Aloe vera, cleanses, refreshes, soothes and nourishes the hair follicles. Cleaning out the hair follicles and fertilizing them will create a PH balanced scalp optimal for hair growth. You would be surprised how your scalp looks under a microscope. Many times your slow hair growth is due to clogged or partially clogged hair follicles. Especially if you do lots of co washes or do not wash your hair weekly with a shampoo. If your hair growth appears to be slow do not be so quick to think it is genetics. It could be bad hair habits of not washing it enough. If you have not deep cleansed your hair in a few months, do a series of deep shampoos twice a week for 3 shampoos. Deep cleansers are normally stronger than regular cleansers, so be sure to deep condition well after you deep cleanse. Trimming on the right high energy day can double your hair growth rate. Since you should have a regular trim schedule, why not try trimming on certain high energy days when you do. Subscribe to this blog and you will receive the best new moon dates each month. I provide you with the best days to trim for increased hair growth. My days have produced greats results for people. Try it next month. Subscribe and wait for July dates to post, then decide which day you will trim your hair. Omegas 3, 6 and 9 are all fatty acids. These fatty acid benefit the hair greatly. Lots of hair issues come from inflammation. These fatty acids help with inflammation. 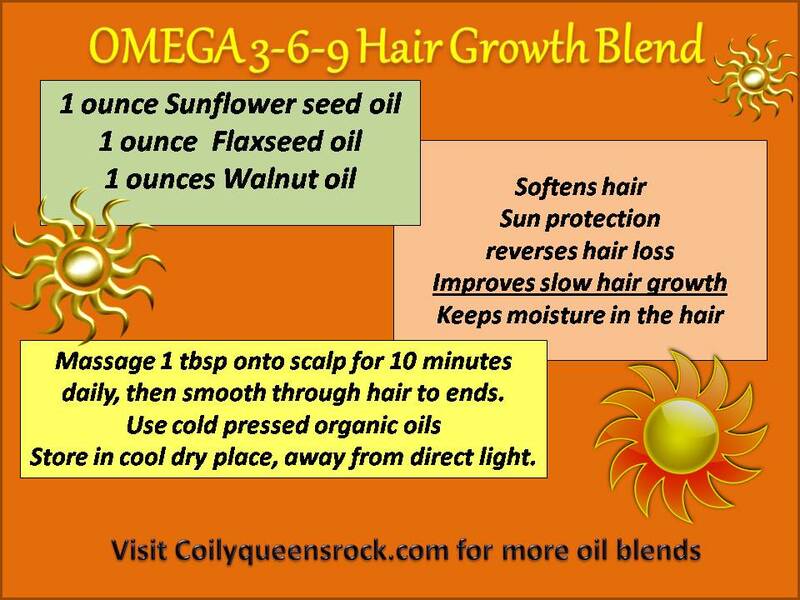 These fatty acids strengthen your hair, improves elasticity, reverse some types of hair loss and heal scalp irritations. 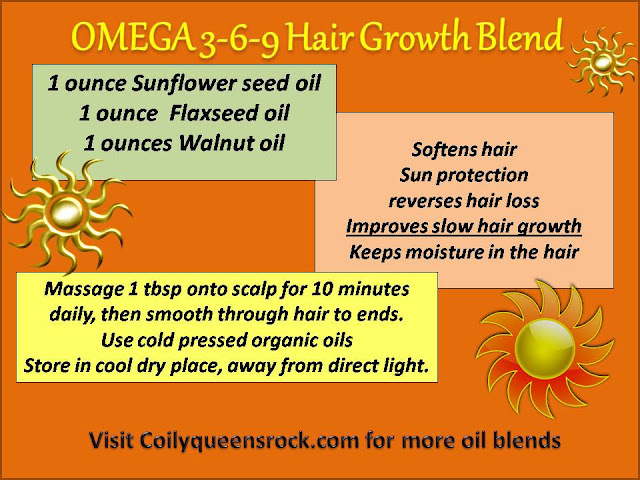 Omegas 3, 6, 9 help to keep moisture from escaping your hair so quickly. Super soft hair that does not easily break when manipulated is what you get with repeated use of these fatty acids. 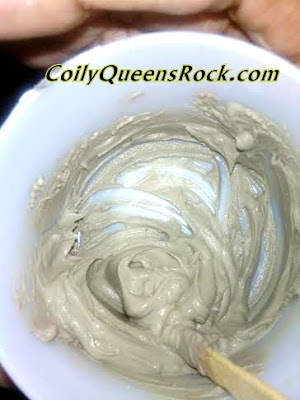 Massage one tablespoon daily to your scalp for 10 minutes. Then smooth throughout your hair shaft. This oil mix will increase your hair growth, give you great sheen, incredible softness and UV protection from the sun. Can the omega 3 oil blend be use as one of a simulation oil recommended oil stimulate in the CQ Regimen. Can those be rotated or I have to stick to one oil recipe? Thank you I did not know about the stimulation exercise. 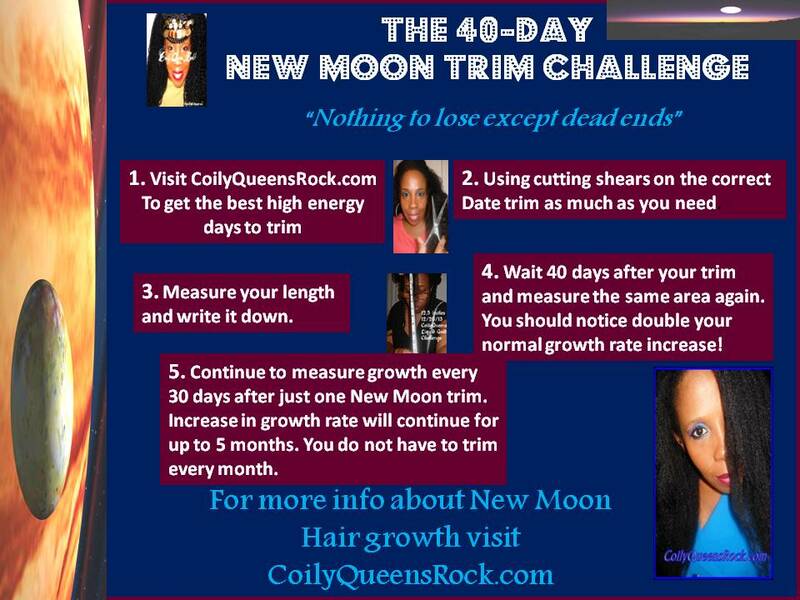 I remember my Grandmother would always say cut your hair when the moon is growing! !